Does this count as a dream? *Note: I reserve the right to change this. Whenever. Recently I turned 35, which means I’m supposed to be having some sort of mid-life crisis. Unfortunately I can’t quite afford a Porche (I drive a newer model Prius… and I want a Tesla) but like almost anyone I have those days where I question myself and what I’m doing with my life. They say to be successful in life you have to have a dream. Well, I don’t. Actually I do, but it’s not specific, it’s not “I want to be a CEO!” (Because in most cases, I don’t.) or “I want to be a movie star!” (Who doesn’t, but that doesn’t feel like my “destiny”.) The only thing I can see is something similar to that photo. 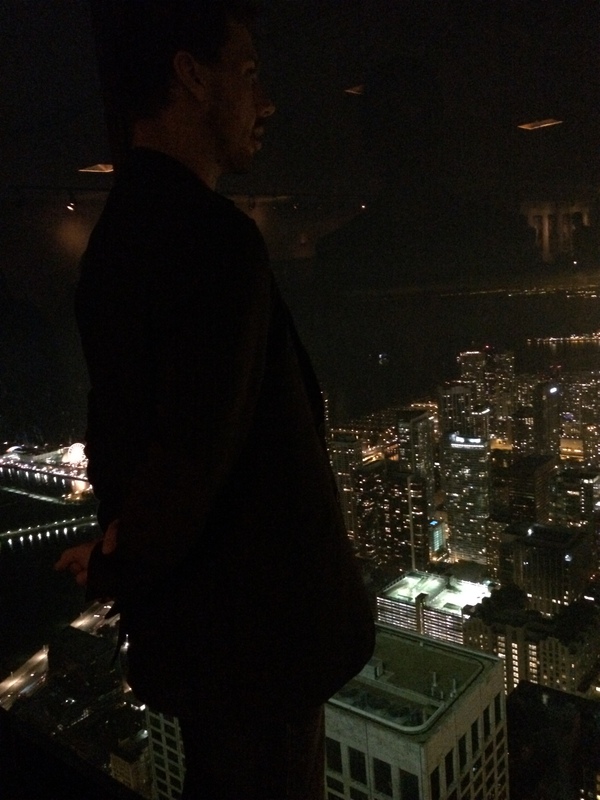 That’s me, looking at the city (that’s Chicago but it could be any one) below me, knowing I made it. Because frankly, I come from a long line of people who didn’t. I’ve been homeless and forced to rely on the good will of others just like my parents before me. The one thing I’ve always been is different, and eventually I found a means to make progress by putting that to work serving the visions of others. For now I’ve realized I am a hedonist, taking pleasure in life as it comes. Perhaps when you’ve been a bachelor as long as I have it’s hard to imagine life any other way. Or perhaps when you decide to be really honest with yourself, things just break down into basic, simple concepts like happiness, pleasure through senses and experiences. (Don’t worry Dr. Freud, I’m REALLY good at delayed gratification strategies too.) I’m VERY patient, and it’s worth it. My world is not black and white. I don’t follow rules that don’t make sense to me just because it might make somebody mad and I am true to myself above all else. I’ve been called “The Devil” “The Secret” “Guilty Pleasure” and many other less flattering names, and I’ve enjoyed more experiences in my lifetime than many much older than I am. I live in the grey area of enjoying life now and expecting to later without fearing the judgement of my god or the sting of regret. I will regret more if I do less, if I miss this opportunity (whatever it might be.) But I am also by no means stupid. This world is as dangerous in pleasures as it can be in pain. The one great betrayal of selfishness is when you drag others down and hurt them through your inconsideration. I am VERY selfish, but more considerate than most. I like to think I know how to navigate those waters, but I also know better than to get cocky. Everyone wants to be understood. I’m told I’m charismatic in person, but I think I write more intelligently than I speak (most days.) I like writing! The downside is that I babble and things become needlessly long (like this…) Fortunately, I also love photography, so you’ll see some pretty pictures to break up the monotony of text. Anyway, if at any point I inspire you to think, I’ll call that a win.